For those who have never been to Indonesia, I bet you will say what Chocolate Sweetened Condensed Milk is. In Indonesia, we know two kinds of Condensed Milk, one is the regular and another one is flavoured with chocolate. We use this milk for our avocado shake, cake and dessert thingy, drizzle over our bread and beverages. Well, for you guys who live in Singapore, you can get that flavoured milk at www.belanja.com.sg. For your information, the well known brands of sweetened condensed milk in the country are cap bendera (frisian flag), indomilk and dairy farm. Are there any other new brands come out? I have no idea. Those three are the ones that I recalled. I have been in Winnipeg for 5 years and not seen the flavoured sweetened condensed milk yet. If I want to get it, I have to buy it from Indonesian food online stores. 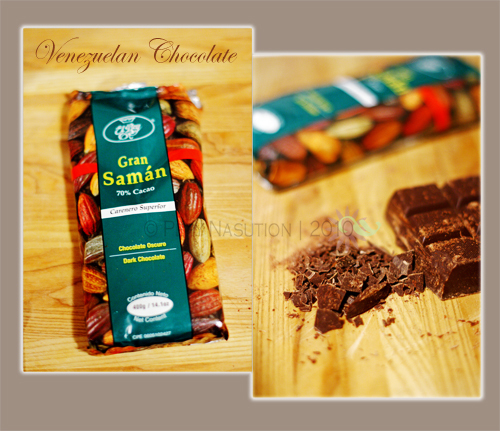 Then, I decided to make the homemade version as I have a chocolate bar, El Rey Gran Saman Dark 70%. This chocolate was a gift from a good friend of mine, Mindy or I call her Mindoel. She resided in Caracas, Venezuela and this August, she moved back to Germany for good. Thanks, Ndoel! Hope you settle soon and we can chit chat again :D.
By the way, I also made my own chocolate spread and syrup with this chocolate bar. How to make this homemade chocolate sweetened condensed milk? Sorry, no measurement here. So, what is the difference between evaporated milk and sweetened condensed milk? Those two are very similar, but the sweetened one add more sugar. There is a bit distinct between sweetened condensed milk South East Asia and other places. In SE Asia, the sweetened one is also added by palm oil to reduce the cost. piye nek njajal gawe soko whole milk dan gula Pep? Jd kangen susu bendera coklat..hiks..
Nyummmm…. I really like chocolate and condensed milk, and to have them both together is wow! It's mouthwatering, I have to make this soon! Great idea to make your own when you couldn't find this product ready-made. I've never heard of it before as you expected, but combining 2 of my favorite ingredients can only be result in something wonderful. I used condensed milk for the first time when I made rice pudding…and I bet it would be even better with chocolate condensed milk. A wonderful post with gorgeous pictures! You make your own choco condensed milk, wow! I can actually buy it online here, in the Toko Indonesia I told you a few days ago. At least we have such an online shop in Germany, even though it's of course not thaaaat complete. owh…disini gak ada susu kental manis coklat…dikau baek bgt menginspirasiin ini qiqiqiqi…cobain aaaahhh…. Lot of brands for sweet condensed milk here … I think I am so lucky don't have to make it my own hehehe 😀 My kids love to put it on their white bread for breakfast, pudding, strawberries, etc. Hehehe, that's one simple thing I think I would miss also if have to move away from Indonesia Pepy. I didn't know that it's such a rarity elsewhere.Just to update you with the market condition; we now have another variant of the condensed milks, which are made from creamer; they're less thick, and less heavy compared to the standard susu kental manis, but it's more affordable hence why they're quickly becoming very popular with the street food vendors like the martabak manis sellers.And after a while, the regular susu kental manis has also lower its quality into having such thin consistency and easily dripping; making eating your white bread with this new generation susu kental manis is quite messy.But after some long while again, the good old regular susu kental manis is back in the market, though now it's branded as "premium" sweetened condensed milk. Silly…And beside of the regular and chocolate flavoured, one of the major brand (Frisian Flag I think) once created a strawberry flavoured condensed milk, but it has a very short life span. Hehehe, that's one simple thing I think I would miss also if have to move away from Indonesia Pepy. I didn't know that it's such a rarity elsewhere. Just to update you with the market condition; we now have another variant of the condensed milks, which are made from creamer; they're less thick, and less heavy compared to the standard susu kental manis, but it's more affordable hence why they're quickly becoming very popular with the street food vendors like the martabak manis sellers. And after a while, the regular susu kental manis has also lower its quality into having such thin consistency and easily dripping; making eating your white bread with this new generation susu kental manis is quite messy. And beside of the regular and chocolate flavoured, one of the major brand (Frisian Flag I think) once created a strawberry flavoured condensed milk, but it has a very short life span. will make a chocolate version next time I make condensed milk, want to try it with jus alpukat.. yummy! Looking forward to see that post!